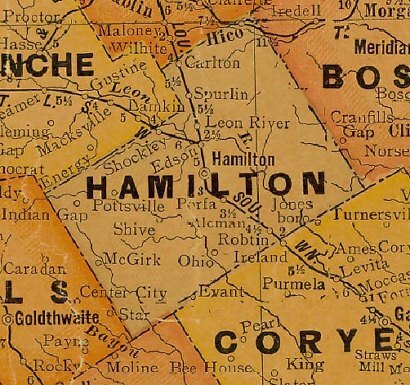 Ohio, Texas, Hamilton County ghost town. William T. Baker, a former resident of Ohio settled here in the late 1870s. Baker opened a store and became a postmaster when one was granted in 1882. The post office was later moved to Cowhouse Creek. This new village kept the same name but the post office closed in 1920. The population was only 20 for both the 1930 and 1940 Census. Ohio's last business closed during WWII.